Project types are the different categories of projects which an organization is executing. This depends on the organization need. For example, a software consulting company can have a different type of projects like “Web Development”, “Application Development” etc. Click + Add Project Type green button on the top-right side of the application. Enter new Project Type in Project Type form which you want to add. Click on Add Project Type to add this in TimeLive. Scroll to the type you want to edit, click the Options gear icon and select Edit Project Type option. Make the changes in the field. 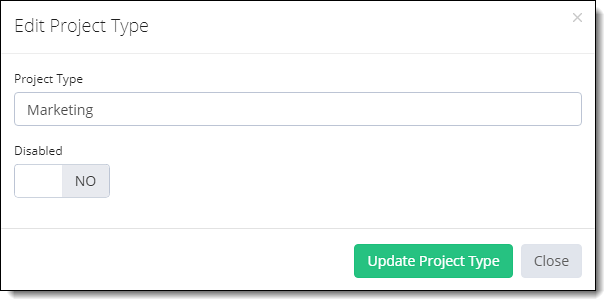 Click Update Project Type button to update changes. Scroll to the type you want to disable, click the Options gear icon and select Edit Project Type option.